For the tools & knowledge to help you build your dreams! We're looking for qualified people who want to own their own Ace Hardware store…or even a chain of stores, and we have an exciting new, exclusive incentive package for qualified candidates. So if you're looking for the opportunity to play a vital role in your community, to help your neighbors, to be a stalwart of your local marketplace, and to build a business, Ace could be the place for you. Ace has been America's neighborhood hardware retailer for eight decades. Throughout the decades - through booms and busts, war and peace, fads and legitimate breakthroughs - we've been a cornerstone of neighborhood commerce. Today, the opportunity has never been greater. The "do-it-yourself" market is thriving. And Ace Hardware remains poised to serve and thrive, as well. Today, Ace retailers have built their annual retail sales to more than $13 billion. And the future looks bright. The hardware industry is not only stable, it's expanding. America is fast becoming a nation of do-it-yourselfers. Just take a look at your local TV listings, brimming with home-improvement programming (source: Hardware Retailing Dec. 2006). What's more, studies indicate that home-improvement sales will grow at 5.7 percent from 2005 to 2010 (source: Do it Yourself Retailing Dec. 2006). And according to a 2006 Yankelovich study, the average homeowner is expected to do three projects over the next year, primarily in the areas of painting and landscaping, with a total spending budget of approximately $2,000. Since the Ace Hardware cooperative structure allows our buyers to negotiate with combined buying-power of over 4,800 locations, our store owners have a significant advantage over non-affiliated stores. Our regional and state-of-the-art distribution centers and computerized ordering give you efficient access to more than 70,000 items in every major hardware category. Your Ace Hardware store will also be equipped with a proprietary computerized management system, which will provide accurate sales transaction processing, detailed sales and expense information, and extensive inventory management and ordering features to help you run a "tight ship." But being a part of the Ace family has other advantages - shared innovations, corporate marketing insight and state-of-the-art retailing design, to name a few. You'll be backed by national media advertising, proven business models and a corporate culture that is driven by service and innovation. A true co-op atmosphere Including owners, store personnel, retail support and corporate employees, there are more than 80,000 members in the Ace Hardware team. Their combined talents strengthen the Ace name. Their vision propels the future of the corporation. And their dedication and expertise works to help all Ace Hardware owners run their business efficiently. Ace retailers have built their annual retail sales to nearly $13 billion, and the future looks bright. The hardware industry is stable and expanding. America is fast becoming a nation of do-it-yourselfers. Just take a look at your local TV listings, brimming with home-improvement programming. Best of all, Ace offers established brand awareness with one of the top 100 most recognizable brands in the world! With over 80 years of experience, we continue to grow because of the level of service we provide our customers. Backed by a state-of-the-art distribution system, dedicated corporate support, and the knowledge and talents of our 80,000 team members, we look forward to advancing our tradition of service, solid corporate citizenship and success. For the tools and knowledge to help you build your dreams! We're looking for qualified people who want to own their own Ace Hardware store... or even a chain of stores, and we have an exciting new exclusive incentive package for qualified candidates. Unlike Any Other Opportunity on the Planet What other company reduces the cost of entry rather than charging for it? We're now offering qualified candidates our most comprehensive business opportunity in our 80-year history. We are now providing qualified individuals with an incentive package to assist in your opening. Our incentive package helps prepare you for ownership and can drive down the total investment for a business by nearly 20 percent. Additionally, an enhanced incentives package is available when you decide to open additional stores. With over 80 years of experience, we continue to grow because of the level of service we provide our customers. Backed by a state-of-the-art distribution system, dedicated corporate support, and the knowledge and talents of our 80,000-team members, we look forward to advancing our tradition of service, solid corporate citizenship and success. If you'd like to receive more information about how you can build a strong future with Ace, please complete the Rapid Request below. * Total investment figure is based on 14,000 retail square foot store. Total Investment will vary based on store size. Items included in this figure are store fixtures, inventory, office equipment, computer system, decor, signage and operating capital. These costs do not include such things as land and building costs or leasehold improvements. 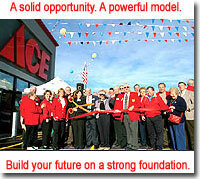 Click on Request Information for FREE info on how to open a Ace Hardware franchise today! Please Note: This Ace Hardware franchise opportunity and other franchise business opportunities, businesses and franchises for sale on this web site are not to be considered as an "offering", "franchise offering", suggestion or recommendation by Franchise Leader™. This advertisement depends entirely on the truthfulness of the information provided by our advertisers which includes, but is not limited to, franchisers, franchise brokers, franchise consultants and business brokers. Franchise Leader™ recommends that you consult a lawyer, financial consultant, accountant or professional advisor before buying a franchise or business opportunity or any type of business. By using this form or any part of our website, you have agreed to all terms and conditions of Franchise Leader™. Please review our Terms & Conditions for more information.